Stretch nylon and lace cup. Shirred elastic won't roll or curl. Attractive lace inset and shirred elastic that won’t roll or curl. Stays put for all-day support. The perfect mix of fashion and function. 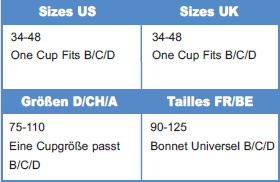 One cup adjusts to fit B/C/D for easy fit and great comfort. Made from a soft, satiny fabric. Ideal for wear with strapless dresses and tops. Back wing width tapers to 3 1/2 inches. 3 column, 5 row hook and eye back closure. Click the button below to add the Glamorise Complete Comfort Strapless Stay-Up Bra Leopard to your wish list.